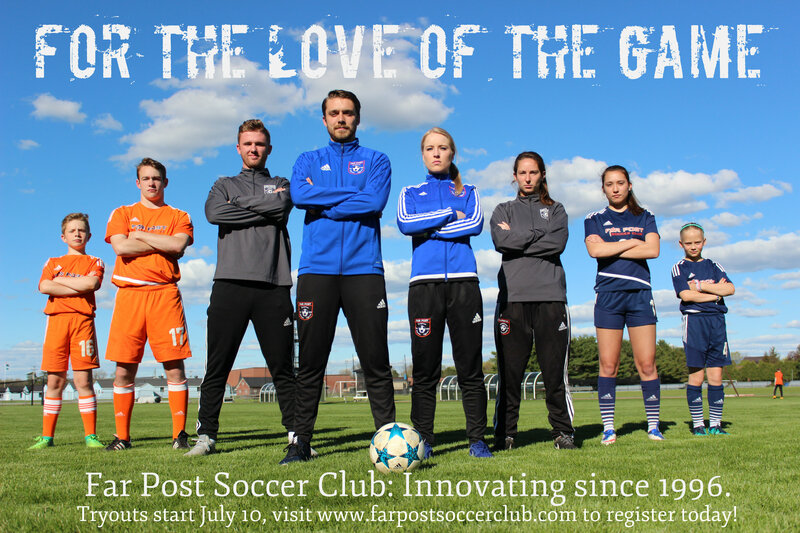 Tryout Dates Announced for 2017/18 Season | Far Post Soccer Club, Inc.
Players born 2009 to 1999 will have opportunity to showcase talent to Far Post coaches between July 10-20. Tryout dates have been set for the 2017/18 season! While we feel that a traditional tryout structure is needed for some age groups, it is not for others. ALL players must register for tryouts at the following link. We encourage you to make both tryout dates if possible, but if you are not able to simply make note on your registration. Please see a brief outline and schedule for each age group below. We will hold two open training sessions for our U10 Boys and Girls so that players can really get a sense of what joining Far Post would be like. Coach Todd Kingsbury, our U10 Program Director, will lead both groups, but boys and girls will be separated by gender. We will not make any cuts at this age. We will hold 2 formal tryouts for these age groups. We will select a 2006 and 2007 Premier team on both the boys and girls sides. We intend to have a 06/07 Club team for both genders as well. Unfortunately, we may need to make some cuts at this age group depnding on numbers. We will hold 2 formal tryouts for these age groups. We will select a 2004 and 2005 Premier team on both the boys and girls sides. We intend to have a 04/05 Club team for both genders as well. Unfortunately, we may need to make some cuts at this age group depnding on numbers. We will NOT have formal tryouts at these age groups. Instead, we will have 4 open play dates where players can come in for a trial. You do not need to come to all dates, but are welcome to. Conversations about roster spots will happen in person. Boys Dates: Thursdays: July 13, 5-6:30pm. July 20, 6:45-8:15pm. July 27, 5-6:30pm. August 3, 6:45-8:15pm. Girls Dates: Thursdays: July 13, 6:45-8:15pm. July 20, 5-6:30pm. July 27, 6:45-8:15pm. August 3, 5-6:30pm. *August 3 trial is @ UVM Track Infield. All others are @ Centennial Field.